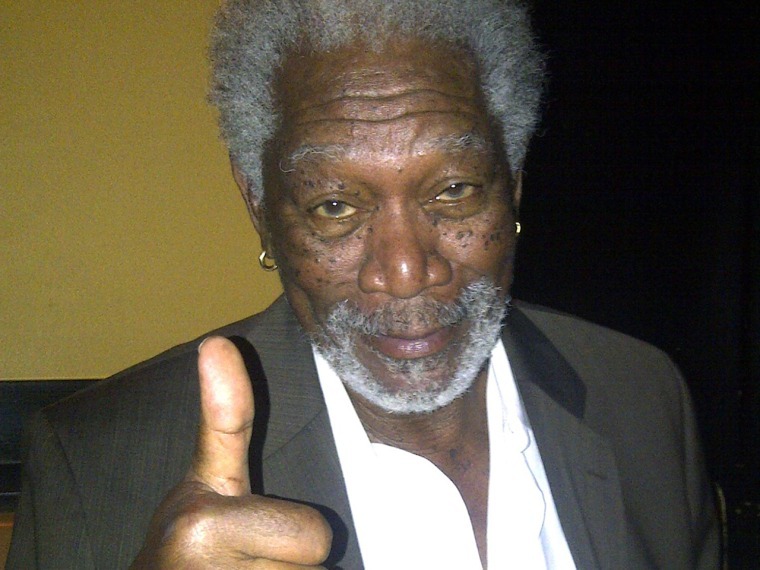 Listen to the voice of God: Morgan Freeman was not actually sleeping during an early-morning interview on Wednesday. The 75-year-old actor was sitting next to Michael Caine during a chat with Seattle's FOX affiliate Q13, when he appeared to doze off as Caine spoke. The two were promoting their new film, "Now You See Me." But seeing is not believing, Morgan wrote on his Facebook page late on Thursday. "I wasn't actually sleeping," said the Oscar-winning actor. "I'm a beta tester for Google Eyelids. I was merely updating my Facebook page." He added a photo of himself giving the camera the thumbs up. Over 17,000 fans approved, leaving over 700 comments. Earlier, he posted a note reminding people to watch him on "The Daily Show" Thursday night -- where he did not fall asleep. But his note hinted sleep could occur at any moment: "You won't want to miss me on 'The Daily Show With Jon Stewart' tonight at 11pm/10 Central, it's going to be a good one. And set your DVR's too...just in case you fall asleep."